Hearthstone is adding new Legendary weapons with the upcoming Kobolds & Catacombs expansion. This is a major addition to the game, so Shacknews is breaking these down individually, moving on to the Shaman. We've looked at three classes that don't normally use weapons. So for today, let's look at one that does. The Shaman has some pretty decent weapon choices already, so what can a Legendary weapon offer that Thrall's normal ones can't? After your hero attacks, Discover a spell and cast it with random targets. 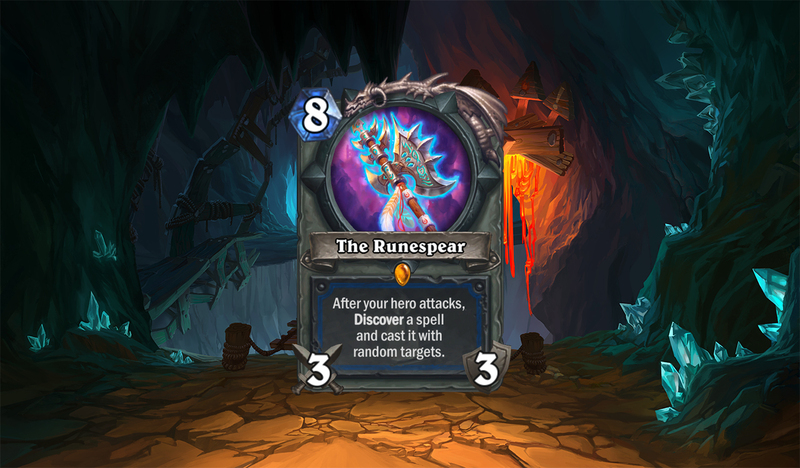 For a Legendary weapon, The Runespear might not even be the Shaman's most physically imposing one. That's still Doomhammer. A 5-cost 2/8 weapon with Windfury is still as scary as it gets, even with the Rockbiter Weapon nerf. A 3/3 certainly isn't going to challenge it, in terms of pure stregnth. 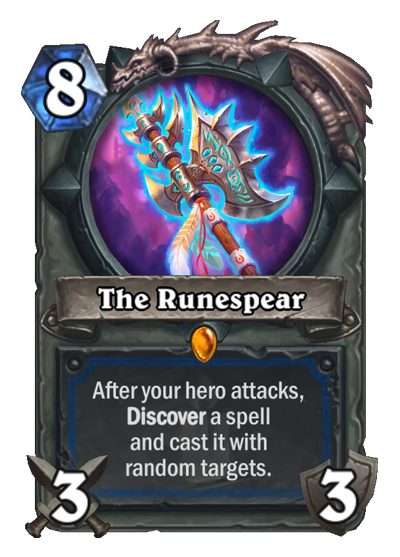 What The Runespear does offer is a unique Discover mechanic, allowing the Shaman wielder to find and immediately use a new spell everytime he attacks with it. That would be fine and all, except that the spell is cast on random targets. That might make this weapon more trouble than it's worth. But hey, it might still fit in a few deck types. The Discover mechanic on this weapon makes such a huge difference, because it slightly minimizes the "random targets" risk. The Shaman has some key spells that get around the "random" whamy, like Evolve, Devolve, Feral Spirit, Lightning Storm, Spirit Echo, Maelstrom Portal, Far Sight, and Bloodlust. Needless to say, any of those options are preferable to a burst spell that might end with you shooting yourself in the face. The potential of pulling Evolve makes this weapon an enticing option for Evolve Shaman. But it might actually find a better home in Aggro or Quest Shaman, just because those decks are more about trying to go face above all else. But in those instances, it would act more as a fallback option, because let's face it, a Turn 8 3/3 feels far too slow in a quickie aggro or Murloc deck. I will say that while it's hard to pin down exactly what deck will best utilize The Runespear, it is safe to say that this will be the first of the Legendaries to benefit from Captain Greenskin. 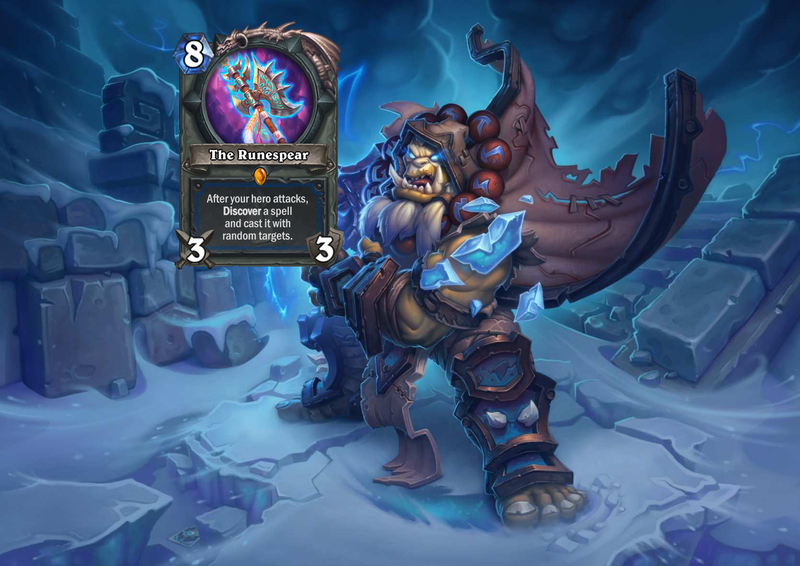 Because The Runespear's usefulness is only as good as the number of times the Shaman attacks, it's in the player's best interest to buff this weapon's durability up as much as possible.